San Francisco (Obama.net)- It has been nearly two years since President Barack Obama was inaugurated as the 44th President of the United States of America. When he came into office, the stock market was in the worst shape it had been since the days of the Great Depression when Franklin D. Roosevelt was President. Much like Roosevelt, Obama faced a long, slow climb back to economic stability. Where Roosevelt had the New Deal and Bank Reforms among other new policies, Obama had stimulus packages, Wall Street Reforms, and others that were designed to better the economic landscape of the United States. For the last two years, the stock market has slowly been creeping back up from the deep pit it was in. With Obama’s policies, new jobs were created and businesses were revitalized while others were created. Wednesday, the results of Obama’s work became clear by the spikes in the stock market. 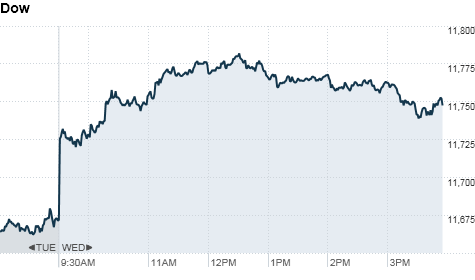 The Dow Jones rose seven-tenths of a percent, or eighty-three points. It closed at 11,755.44 points. The Dow Jones has not been that high since September of 2008. JP Morgan Chase, Bank of America, American Express, and Boeing all saw major gains on Wednesday to help the Dow Jones rise so much. The S&P 500 jumped eleven points and nine-tenths of a percent to finish the day at 1,285.96 points. The S&P 500 has not seen numbers that high since August of 2008. Nasdaq also saw favorable results on Wednesday. With an increase of eight-tenths of a percent or twenty points, Nasdaq saw its best numbers in three years with a closing at 2,737.33 points. With the boost coming from Portugal auctioning off their debt, the European stock market also saw growth. Overall, the stock markets of the world all saw notable rises that are making 2011 look very promising. With the job growth increasing every month and the unemployment rate dropping little by little as more and more jobs are being made available about new industries and old industries that have seen reinvestment, it is hard to argue that the economy of the United States of America, as well as the world, is not well on its way to full recovery.